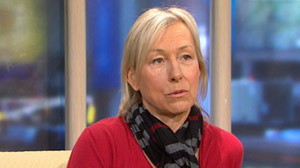 Martina Navratilova has been diagnosed with breast cancer, she announced on "Good Morning America" today. The day she received her diagnosis was her "personal 9/11," Navratilova told "GMA" anchor Robin Roberts. "I was devastated." In February, the tennis legend was diagnosed with an aggressive form of ductal carcinoma in situ (DCIS), considered the earliest form of breast cancer. Navratilova said she had a lumpectomy three weeks ago, during which her doctors determined that the cancer had not spread to her lymph nodes. She says there is only a "very small chance of it coming back." "It is just in that one breast," she said. "I'm okay and I'll make a full recovery." As part of her treatment, she will undergo six weeks of radiation in May. Navratilova says she's feeling physically well but has difficult days emotionally, especially when it comes to talking about the diagnosis, which came as a shock. "I'm this healthy person, I've been healthy all my life, and all of a sudden I have cancer, are you kidding me?" she said. Navratilova's cancer was diagnosed during a routine mammogram, after not having one for four years, and she hopes that speaking out will inspire other women to get mammograms. "The reason I wanted to speak about this is to encourage these woman to have mammograms," she said. "I just want to encourage women to have that yearly check-up." She was feeling healthy at the time of her diagnosis. "I was feeling absolutely 100 percent fine," she said. Navratilova will be hosting a live Web chat on Thursday, April 8, 2010 at 1 p.m. on the AARP Web site. CLICK HERE to learn more and register to participate. "The cancer knows that you're not 50 yet?" she said. "I can't speak for the doctors, but in my personal case I'm so glad that I did it." Cancer hasn't slowed down the woman who is the Health and Fitness Ambassador for the AARP. Navratilova played in the Hit for Haiti tennis fundraiser two weeks after her lumpectomy and rode a bike 25 miles in a triathlon relay in Hawaii in March. She will travel to France to work as a commentator at the French Open for The Tennis Channel while undergoing radiation, and she plans to climb Mount Kilimanjaro in December. At 53, she still plays tennis and hockey. She says she's also learned the importance of asking for help and support, because "the emotions took so much physical strength out of me." "The chances of recovery are that much greater when you have that support group," she said. "It's difficult for women to ask for help." The woman who holds countless records on the tennis court thinks she might have set another record when it came to the size of her support network. "I had seven friends there for the lumpectomy," she said. Navratilova was born in Czechoslovakia and came to America to play tennis in 1973. During her tennis career, she won 18 Grand Slam Singles titles and a record 31 Grand Slam Doubles titles. She and was ranked #1 in the world for 331 weeks. Navratilova retired from the game in 1994 and was inducted into International Tennis Hall of Fame in 2000, but returned to competitive tennis nearly a decade later. In 2004, she became the oldest woman since 1922 to win a Singles Match at Wimbledon at the age of 47 and she also holds the record as the oldest person to win a Women's Singles Grand Slam at almost 50 years old. Navratilova has always been committed to promoting exercise and a healthy lifestyle. In 2008, she shared recipes from her diet and fitness book "Shape Your Self" with "GMA" and says she became involved with the AARP to inspire the group's members to stay active and healthy. "I do know that most people can do more than they do with their life," she told ABC News in 2004. "I wish they wouldn't use age as an excuse to not to something. That should not be a determining factor whether they are going to do something or not. So 30, 40 who cares? Just go out there and do it."